So we’re in the Midwest, staying with friends in suburban Michigan. The neighbourhood has spacious homes on generous plots of land. The many trees are shedding leaves in rich shades of orange, yellow and red, carpeting extensive green lawns, or piled into order by industrial size leaf blowers. At the very least, homes have colourful pumpkins on display, stacked on the porch steps for all to admire. 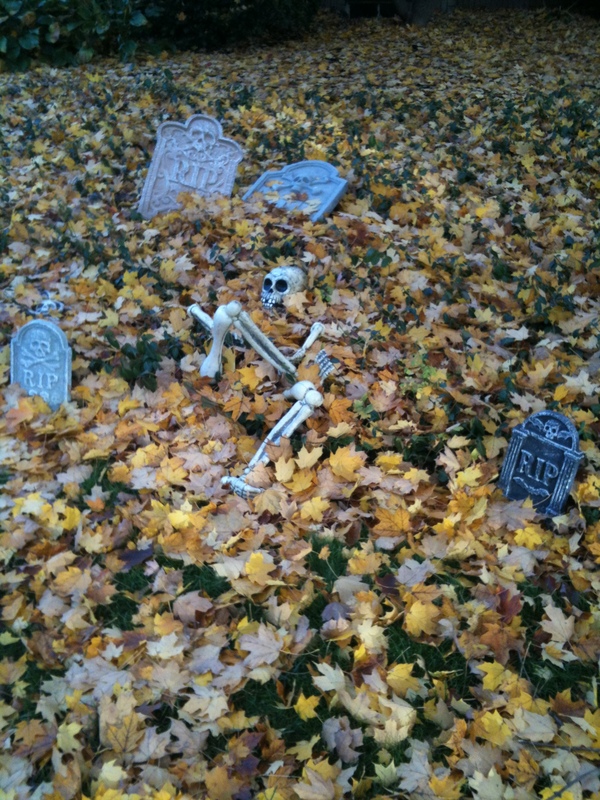 Some homes, however, have front yard displays to celebrate the macabre. We’re beginning to see that a little bit in the UK now, of course, but here it’s in a different league. We’ve spotted fake graveyards (raven optional), enormous spiders with their fake cobwebs draped across bushes and ghoulish figures hanging from trees. At one house there’s even a gigantic inflatable black cat leering at us, its head swivelling from side to side. In the local elementary school, the children have a fancy dress parade at Halloween, which the parents go to watch. Our hosts’ kids took part, but there’s nothing spooky or scary here. The 10 year old and her friend were waitresses, complete with aprons, trays and menus. The 8 year old was an owl, proudly swooping around in her feathery wings. The 5 year old didn’t want to wear the Iron Man outfit, preferring a superhero of his own devising. 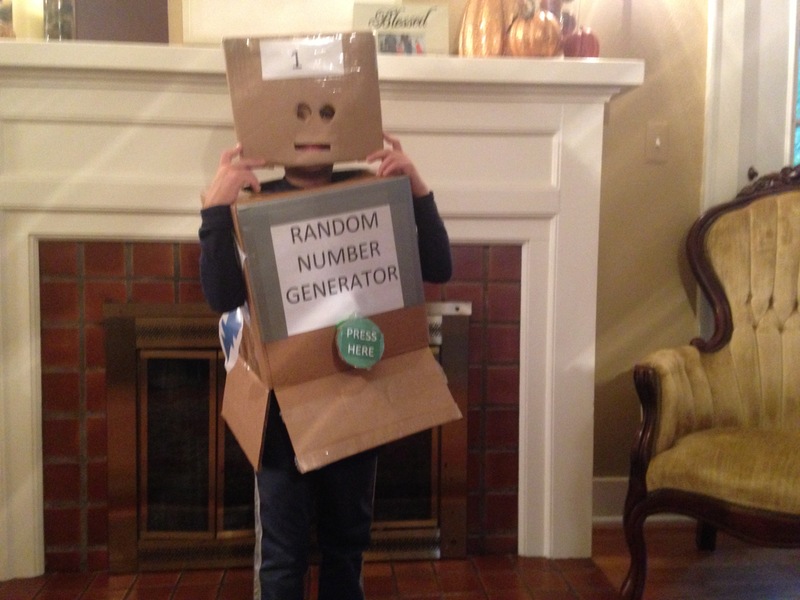 In the end, after some negotiating with his Dad, he became a Random Number Generator with a costume constructed from two cardboard boxes. The superhero fancy dress theme was in evidence at a local restaurant where we went on Friday for breakfast (pancakes, cream cheese, strawberries and blueberries if you’re wondering) and were served by ‘Miss America’. Batman and Superman were serving tables as well. Halloween was a Saturday this year and unfortunately it poured with rain all afternoon and evening, which meant the carefully prepared costumes for trick or treating were somewhat submerged under raincoats, rain boots (= wellies) and umbrellas. The cardboard boxes stayed at home! Two other families joined us for an early supper and 8 excitable children in assorted costume, accompanied by three dads (normal rainwear) and two people dressed as a middle aged British couple with umbrellas braved the elements and set out on a hunt for free candy. The city authorities decree that trick or treating only takes place between 6 and 8 pm, so if you don’t want to take part you can just switch off the lights and retreat to the back of the house or basement. So the kids look for the homes which have a porch light on – many homes had a lit pumpkin in their windows, or orange fairy lights – and gather in an excited bunch to call ‘trick or treat’. The householder maybe calls ‘Happy Halloween’, admires the costume and awards them a small candy bar each (think fun size Snickers or KitKat). No tricks here – only treats! 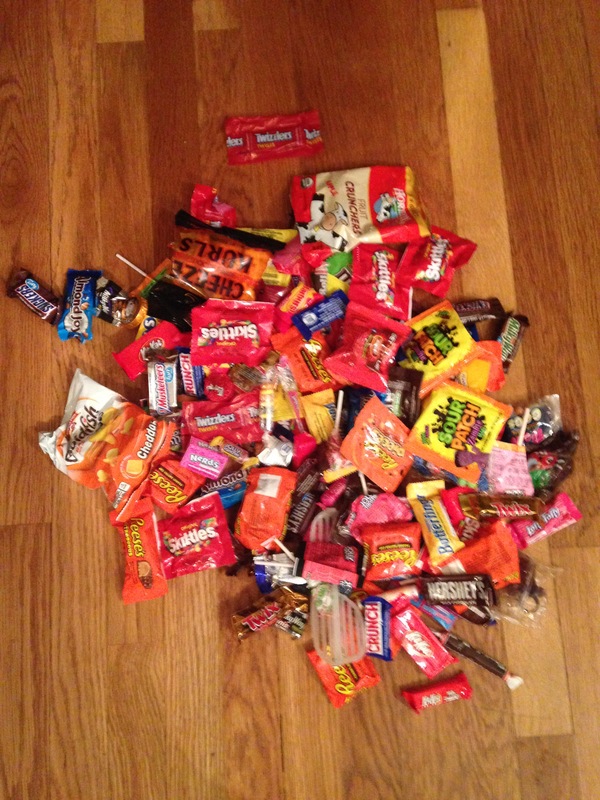 After half an hour of rain, we beat a retreat, and the younger children came home early too, but the lure of free candy was too much for the nearly 12 year old and his friends. After two hours scouring the neighbourhood they arrived home, dripping wet but triumphant, with full plastic buckets whose contents were then tipped out onto the living room carpet. Of course this isn’t the full story of Halloween in America – some friends mentioned that in some places there is more of the dark aspect of trick or treating we’re familiar with in the UK. Exploring the macabre side of Halloween is a subject for another time – see for example this helpful post from J John. But it’s worth reflecting about what is going on under the surface even with the innocent candy feast we experienced. My theory is that, no matter what their origin (and that’s another subject, too) folk customs such as the American Halloween trick or treat are reinterpreted in every generation to meet an ongoing need or give opportunity to express a value deeply held. If they don’t meet that need they die out. So what does Halloween say about American values? My tentative suggestion is the indulgence and positive affirmation of children together with a focus on plentiful supply. There’s something deep in the American psyche, forged from the pioneer spirit and the overcoming of tough obstacles to build a new nation, which affirms that abundance of food is a good thing. Not only abundance, but excess – full and overflowing.